The Junkers K 47 was a fighter developed in Germany during the late 1920s, a civil development of which was designated the A 48. Designed to meet a requirement of the Turkish government for a new fighter, the K 47 was a strut-braced, low-wing monoplane of conventional design. Two open cockpits accommodated the pilot and tail-gunner, and the empennage was designed with twin vertical surfaces to maximise the rearward field of fire. The main units of the fixed, tailskid undercarriage shared part of the truss structure that braced the wings. The design was originally undertaken by Karl Plauth, but completed after his death by Hermann Pohlmann. By the time the K 47 prototype was complete, Turkey had already lost interest in the type, but with the Soviet Union indicating interest, work continued. Eventually, however, the Soviet government only purchased two or three examples, and the only operational use of the type was China, which bought ten or twelve aircraft, naming the type the Tien Chu. Demonstrations were also carried out in Romania, Portugal, and Latvia without any resulting orders, although one aircraft may have been purchased by Japan. 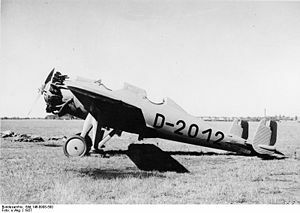 Three aircraft were used by the Reichswehr clandestine training facility at Lipetsk and a small number of the unarmed civil version were purchased by the DVS. K 47s were also used in trials to investigate dive bombing, experiments that would be formative of Pohlmann's thinking in designing the Ju 87. Indeed, the second Ju 87 prototype was fitted with a K 47 tail. Taylor, Michael J. H. (1989). Jane's Encyclopedia of Aviation. London: Studio Editions. pp.546.